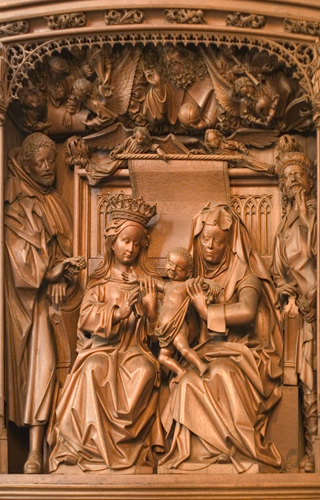 In the center between Mary and Anne is the Child Jesus with his arms outstretched in the form of a cross. Clothes were added to him in 1902, as was Mary’s crown. On the left Joseph offers grapes for the Child. On the right are Anne’s three husbands (not so visible from the angle this photograph was taken), as found in spurious legends reported by Gerson and others. After Joachim’s death, Anne is said to have married Cleophas, by whom she became the mother of Mary Cleophas, who gave birth to “the brothers of Jesus.” Then after his death she married Salomas, by whom she became the mother of Maria Salomae.